I've owned the "before" version of this bow front chest for several years. I fell hard and fast for the size and shape but I was never ever in love with the wood. Painting it was an easy choice. But what next? Aside from the bow front, this chest couldn't be more blah. Then I found inspiration in hand painted furniture by Patina. Perfect. The body of the chest was painted Cloudy Morning by Kilz. The branches were painted with acrylic craft paint. I found the vintage bird graphics at The Graphics Fairy, printed them on card stock and used Mod Podge to decoupage them onto the front of the chest. The original drawer hardware was bold and beautiful. However, it was a bit too distracting so I removed the back plate and painted the pulls the same pale blue gray as the chest. that's so very pretty. Well done! My most favourite project of them all so far! I even dream about it I'm sure.... I'd love to do something like that to my dresser! If I were ever to get so adventurous... any tips for success with the painting? I think you've done just an amazing job. OHHH I love it. Makes me want to get my brushes out!!!! What a great job. Love how this turned out. I knew it was your's as soon as I saw it. Beautiful! Gorgeous, Beautiful, Stunning! I love this piece too! LOVE, LOVE, LOVE the birds! You did an amazing job! i don't think i could be more in awe of you right now! first of all.. to have the guts to try to copy that beautiful inspiration piece.. wow! but to pull it off so well is really something you should be incredibly proud of!! :) and FYI.. i L.O.V.E. the birds! i tend to gravitate towards them too! really.. amazing job! kudos to you!! PS.. just might have to showcase this on my blog! Amazing and so easy to do...it sure looks like an expensive piece of furniture!!! Kudos!!! I love this! It is so cute and so easy! Thanks for sharing your beautiful chest. It is quite inspiring! Gosh, Lindy...this is just beautiful. The great thing is that even ME, the craftless one, might could do this. Very pretty, indeed. Lindy, I am glad that is yours since that is the one I voted for in that contest! Yay! I love it. You are such a great artist. I couldn't make the branches look like that. Hope you link this up, too. WOW!! This is beyond beautiful! This was my favorite too. Voted 3 times for this baby! Gorgeous! To say I adore this chest would be the understatement of the century!!!!! This is just awesome, I love botanicals and birds. What a great choice for your piece. I think that this is your best project ever...but you know how much I like decoupage...and this is so beautifully done. Excellent! You really did a fabulous job. The birds blend in so well they look hand painted, too. Amazing job! I'm speechless. Very inspiring. That is so pretty! And I bet a lot of work!! Love it! Please come over and enter my giveaway!! Lindy your are amazing! I am so in love with this piece. The minute I saw it on crafty with the stars I knew it was yours. I love this Lindy!! I knew this was yours the other day when I was voting for it! Great transformation, you would never guess its the same piece. Thanks so much for sharing. Just started following you a few days ago and love, love, love this idea. Now to figure out what piece of furniture to use! It is absolutely beautiful, Lindy! The before picture makes the end result look even better! Those birds look hand-painted, I had to read your description to learn they weren't. Way to go and I'm excited to see what you come up with in Round 3! I so love that chest. It is absolutely amazing! This is gorgeous! You executed the idea beautifully! The chest is absolutely AMAZING! You are very talented and creative. I especially like how transformed the drawer pulls. So perfect! I love your blog too!! I am sooo head-over-heals crazy about the chest transformation!!! I love birds, and this redo has made quite an impression on me. Just awesome, Lindy! Oh my gosh, Lindy--this is exquisite--WOW!!!! What a beautiful job you did on the dresser! Absolutely awesome, the birds look like they were painted! You have a great blog, it is such an inspiration and I will be a regular visitor. I am new to blogging, I would really appreciate it if you can check out my blog! omg so amazing, can I send you my address as to where to mail this amazing piece lol? You did such a beautiful job! Thanks for sharing! So pretty...it's the one I voted for! Lindy Congrats! I love this piece and I am eyeing a piece of furniture right now that could work with that very technique! Can't wait to see what you are gonna do next! By the way you got my vote! This is awesome it looks like something you would see in the French Palaces. Be sure to check out my blog for a big geveaway. Wow Lindy! How beautiful! You have done an awesome job! Thanks everyone (and thanks, Shelia, for the milkshake). I really need to do a tutorial on the branches and leaves. I'm a painter, I know, but there really is a super easy way to do them! wow! This is beautiful! Great idea to print out the bird images and mod podge them on instead of painting them yourself. You can't even tell! It's amazing! Absolutely love it! I've bookmarked your blog and the Patina website for future reference. You did a fantastic job. I love how your branches turned out. I did a similar treatment on a hutch after seeing yours, and I like how yours turned out better. You have a load of talent...love this look!!!! This is beautiful! I actually thought you painted the birds onto the dresser! Fabulous. I'm following, follow me when you get a chance. I LOVE this chest! I actually voted for it to over at CWTS! It's gorgeous and fun and would work in so many places! Congrats, looking forward to seeing what you do next week! Another absolutely gorgeous creation! I am just amazed at your talent. Well done indeed! A really stunning piece. You did a great job with the makeover. Love you blog and will be coming back again! BEAUTIFUL! You just keep amazing me. This is breathtaking! I love nature and decoupage, so this is right up my alley! You are one talented blogger and decorator, my friend. Absolutely lovely!!! I am inspired! I would love to try this on just about anything. Love the birds. well, could ya use just one more comment? all i can say is wow! I have a wavy front dresser that i want to make asini vanity. i think i'll slow this idea away! I love it, and I especially love that you painted the pulls the same color. I am facing that dilemma right now and wasn't sure if painting them anything other than typical nickel/bronze/whatever would work. Absolutely, unbelievably gorgeous! You are so beyond talented and I could see that being in a boutique somewhere with a very large price tag! Thanks so much for linking this up to Inspiration Friday this week! SO PRETTY!!! Did you seal it with anything besides Modge Podge? Oh WOW! That is just stunning!!! pretty and whimsical and amazing! Wow! I don't think I have enough patience to paint the detail that you do. Great job! My goodness! This is truly beautiful, Lindy! I gasped! You rocked this one! Just saw your mantle post. I'm right there with you! The only time I really like my mantle is at Christmas! So it tends to stay the same the rest of the year because I never know what to do with it! Love the new changes you made! I just found your blog and I am blown away with this piece! It's beyond gorgeous! I am truely inspired now:) Just gotta find the piece of furniture to paint! Fabulous job! I just did a small chest with a bird, I never thought of the graphics fairy...to add some more...just beautiful! Simply stunning, Lindy, as always! I love decoupage, and when combined with paint? Perfect! I love this, what a creative idea and it turned out beautifully!! Loving the bigger scope of sky for watching birds from my new Conservatory. Have long known, the birds may land in my neighbor's gardens but they are still MY birds. Hello there Sweetie! You did a fantastic job! I am 'following' now, and look forward to future inspirations from you! WOW! great job! beautiful piece!! Oh my Lindy, This is a gorgeous chest! Combining the graphics with the paint was a fabulous idea. So beautiful; you are very talented!!! Love this! I'm visiting from B2B where you were featured and I'm a new follower. Great job. Thanks for the inspiration! Fabulous! The pulls are wonderful! Wow - it looks phenomenal! Love, love, love it! This is awesome! What a great idea and wonderful execution! LOOOOVE it! Gorgeous! And so smart! I thought you handpainted it all since the branches were clearly handpainted. I never would have guessed that you printed the birds...you could definitely have fooled me! You have an amazing talent my dear. Dropping over from Cottage Instincts. I am swooning over your lovely piece. The real question is...if I get a chest of drawers will you do this for me? You my dear are dripping with talent. Now that was creative, I love how it turned out! You have created a beautiful one of a kind piece!! WOW! Lindy...you did it again....I am amazed! Oh wow! Found you on the Shapby Chic link party. I've been wanting to go "birds" in my living room and this is such a great idea! I think I already left a comment on your chest, but it never hurts to say again how absolutely stunning this is! The combination of the decopage and the painted branches makes it so unique! How pretty! You did a great job. Dropping by from Met Mon. Hope you'll come see my youngest daughter's dining room redo. This is magnificent. I love everything about it, and the way you placed the birds on the chest. You really created a masterpiece and a wonderful conversation piece for any room as well. Very, VERY nice! I love it!! I'm not usually into paintings on furniture - pictures anyway, but this is fabulous. I was so happy to know you didn't paint those birds by hand, I would have been green with envy. Great project. I featured you this week in my DIY column for examiner.com. What a fabulous transition for this chest of drawers!! I can almost hear those birdies singing they are so enjoying their new home!! Amazing, this just blew me away!!! Ohh my goodness...your bow front chest is absolutely gorgeous, my friend! Ohhh...and I love how you painted the branches and decoupaged those beautiful birds on it! I would just love to have a piece like this! I have a small chest that I could do this with...maybe I'll give it a try! Thanks so much for sharing this beautiful piece with us...as well as the great tutorial! The birds are so sweet on this piece. Absolutely STUNNING! Looks like an extremely expensive piece! Great job!!! The chest is beyond adorable. How clever that you mod podged them. I truly thought you had hand-painted them. Fantastic. How beautiful!!! Wow!!! Amazing !!! This is great. So beautiful.I am hosting a Valentine Giveaway. I would love for you to stop by! I absolutely love this dresser! I think it is really beautiful! Stunning... so whimsical & creative. I think this would be a great dresser in any room of the house! 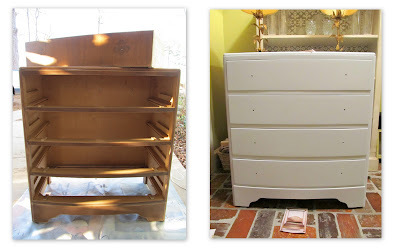 I'm featuring your dresser in the PoPP SPOTLIGHT! Just letting you know I'm featuring this on my blog. I'd love for you to grab a button. wow that is amazing you did a fantastic job. WOW Lindy! I don't know how this is only the first time I am seeing this amazing piece! I saw it on brag Monday at the Graphics Fairy. It is honestly one of the best pieces I have ever seen. Wow!! Just beautiful,you did a wonderful job. Love your blog ,so now I'm following. Hope you'll do the same. This is absolutely stunning! What an amazing transformation, Lindy! Well, all of your transformations are amazing, but this has got to be one of my hands down favorites! I've used several of those beautiful bird images myself. Looks like it should be in an exclusive boutique!!! Absolutely unbelievable! You deserve a big star for this!!! I can't even put into words how perfect this is. STUNNING! Congrats on your Graphics Fairy feature. Absolutely stunning. You should be proud of yourself for doing such an amazing job. I found you via graphics fairy and oh my, this is a drop dead gorgeous chest!!! That looks amazing!!! Fantastic work. This could not be prettier! What a good designer's eye can make out of something less desirable is always refreshing! I'll be sure to come back around for more of your good ideas! That dresser is gorgeous!! I love it! Love the dresser makeover! Truly Awesome! So creative! Beautiful chest and I love birds! I've never seen so many comments on one post...but I have to do it cause I am overwhelmed with this...the best I've ever seen! You need to make a business out of this! Well done new friend! WOW Beautiful Job !!!!! I am becoming a follower! Amazing! I've been wanting to try the decoupage thing on furniture for quite some time and I've heard about that Graphic Queen and how wonderful it is. Job well done!!!! Wow! Have to love this one. Great work. But I'll bet that even THEY would be proud! i absolutely love it !!!.. what a fantastic makeover.. i have a similar shape chest of drawers and would love to do somthing so gorgeous.. somehow i dont think it would look like that!!! Oh my gosh, I LOVE this!!! I came over from Better After because I just had to see how you did it. It looks fantastic! gorgeous, i love all things bird. i would really appreciate if you linked it to my party. You had me at "Patina Furniture". I have so many of those "inspiration" pictures myself.You actually did it! WELL DONE! I love how wispy you made the tree. You've got a very natural painters style. I've always wanted to do more than a shabby chic on a dresser but I tend to chicken out in the end. But, I did only just start painting furniture last year so there is hope for me. Wow!!! This is absolutely incredible!!! I truly love it. So if you ever decide to part with it, could I buy it from you? I wish I could paint so that I could try something like this too! Hmmmm... It doesn't look like my last comment worked, so I'll try again. =) Wow!!! This is absolutely incredible! I absolutely love it, so if you ever decide to part with it, can I buy it from you? I wish I could paint so that I could create one of my own. Truly amazing! This dresser is for the birds! (tongue in cheek) And there's only one word for it: GORGEOUS! And only one word for you (ok, two!) BRILLIANT & TALENTED! How did you get them to print at the right size in high enough resolution? I'm an advanced-middle Photoshop user and yet I still found that even with tweaking, the photo quality wasn't what I was expecting. I am over-thinking it? Did the photos look somewhat pixelated before you modpodged them? Any tips or (even better) a step-by-step??? Beautiful! I'm follow you now!